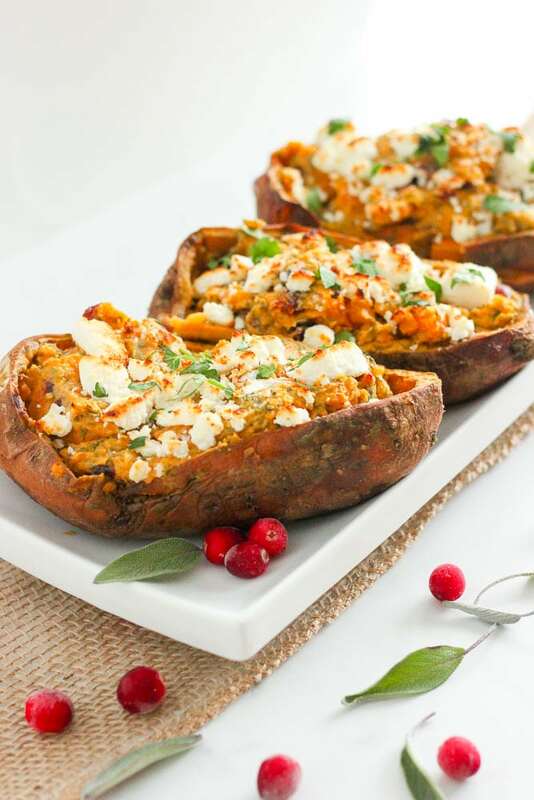 These Healthy Twice Baked Sweet Potatoes are stuffed with goat cheese, cranberries, yogurt and fresh herbs to make a delicious, comforting side dish for any meal – whether it’s a holiday dinner or a casual supper. They’re super easy to make and you can do all the work ahead of time! I really love sweet potatoes. 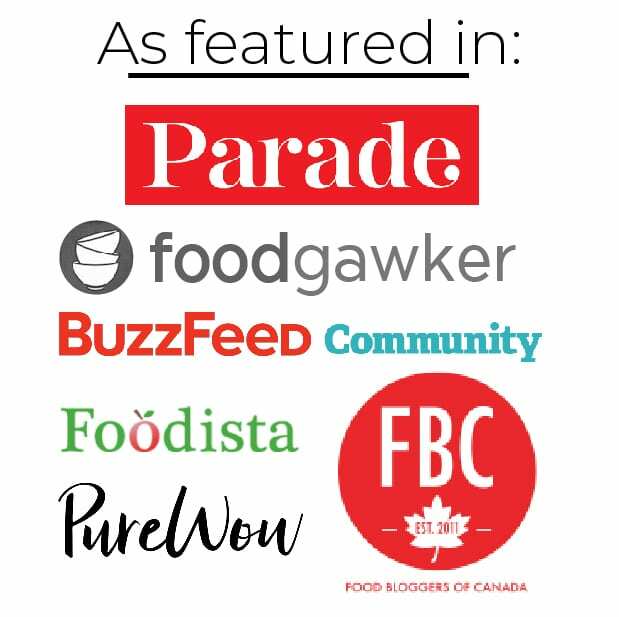 I love how versatile they are, how delicious they are and how they are such nutritional powerhouses. 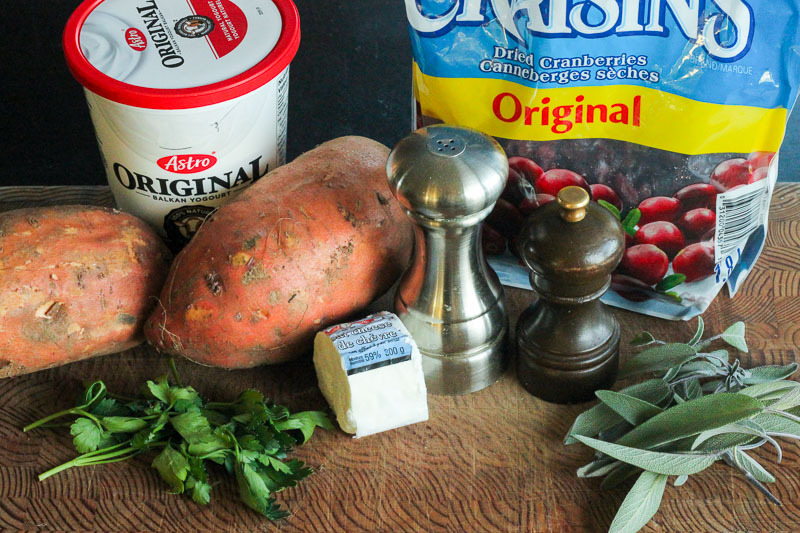 We eat sweet potatoes year round, but they really hit their stride in the fall, and I find they lend themselves to the warm, cozy recipes I want to make when the weather is colder. 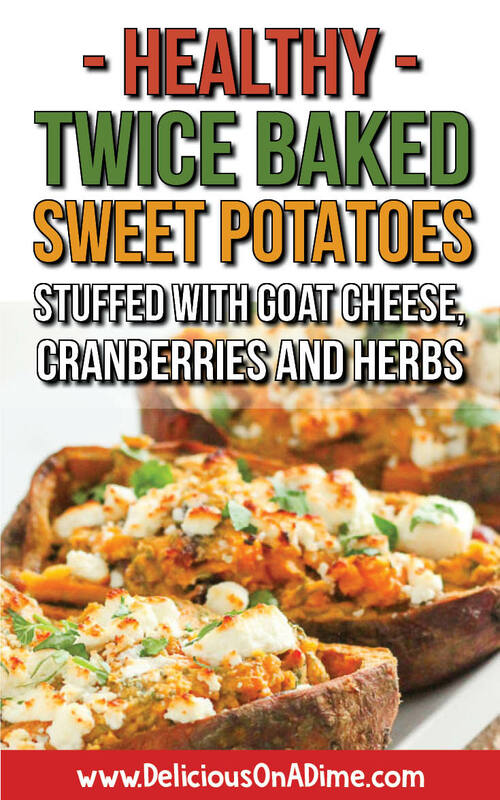 I really love twice baked potatoes, and I’ve been meaning to make twice baked SWEET potatoes for ages. I finally got around to it, and since it’s fall/winter, I stuffed the potatoes with all sorts of delicious, cozy flavours, like sage, dried cranberries, goat cheese and parsley. 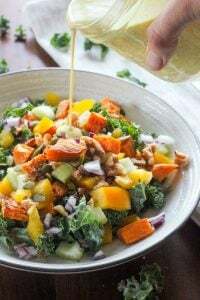 These would make a delicious and beautiful side dish for any meal – fancy or not, and they’re easy to make (even ahead of time!). Sweet potato prices reach all-time lows during the fall and winter, which is great (and they keep for a long time, properly stored!). 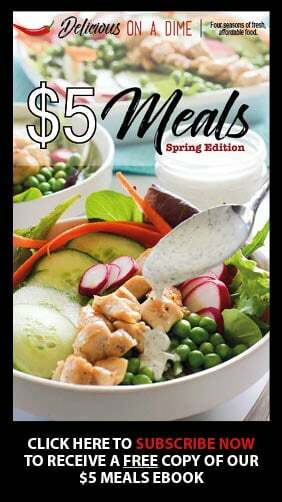 The rest of these ingredients are fairly inexpensive too. I get big bags of dried cranberries at Costco (when I’m stocking my pantry), but you could always hit a bulk bin for them and just buy what you need. I use plain yogurt, always, in place of sour cream, and anytime I want to add creaminess. 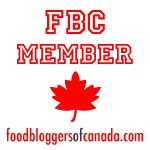 And while goat cheese can sometimes be expensive, this post talks about how I stock up when prices are low and freeze it to use later. Wash two sweet potatoes well. Slice them in half lengthwise and poke them with a fork or a sharp knife a few time. Microwave them, in five minute intervals, until you can easily pierce them with a fork or knife. Mine were quite large and it took 20 minutes in total. Once the sweet potatoes are cooked, carefully scoop out the flesh, leaving a rim of flesh around the edge, to keep the skin intact. 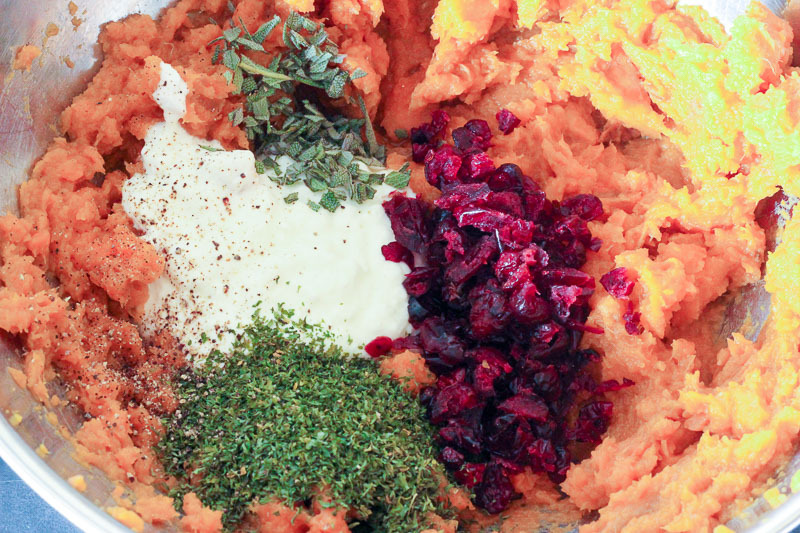 Put the sweet potato in a large bowl and use a hand-mixer to puree it until it’s creamy. Then add 1/2 cup of plain yogurt, 5 leaves of minced fresh sage (if you only have dried, maybe just 1/8 or 1/4 of a teaspoon – it’s strong), 1/4 cup of dried parsley (or 1/2 cup fresh), 1/3 cup of chopped dried cranberries, 1/2 teaspoon of salt and some pepper to taste. 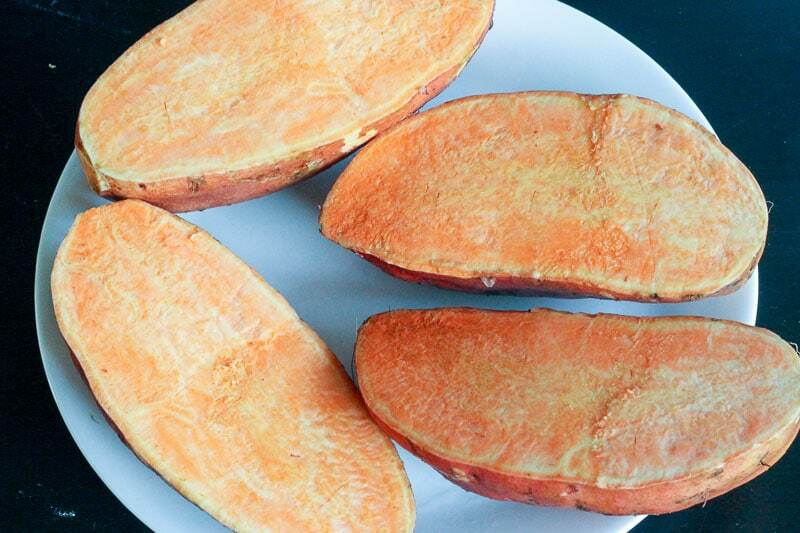 Mix well and scoop back into sweet potato skins. 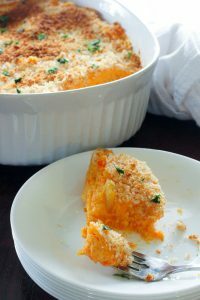 If you’re baking and serving them right away, crumble 2 oz of goat cheese (half a regular sized package) over them and bake in a preheated 350 degree F oven for 10-15 minutes, or until they’re heated through. If you want to brown the goat cheese you can broil them slightly. If you’d rather refrigerate them you can bake them later. Just take them out of the fridge about 15 minutes before baking, and add about 15 minutes to the bake time. 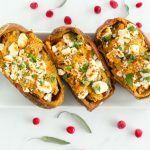 These Healthy Twice Baked Sweet Potatoes are stuffed with goat cheese, cranberries, yogurt and fresh herbs to make a delicious, comforting side dish for any meal - whether it's a holiday dinner or a casual supper. 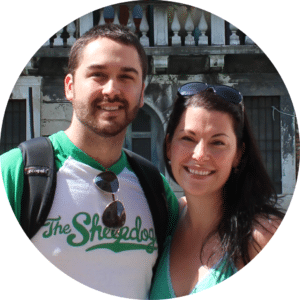 They're super easy to make and you can do all the work ahead of time! Gently scoop out the inside of the sweet potatoes, leaving a bit around the rim to help keep the skins intact. Put the pulp in a large bowl and mix with a handmixer until creamy. Add yogurt and mix well. Stir in parsley, sage, cranberries, salt and pepper. 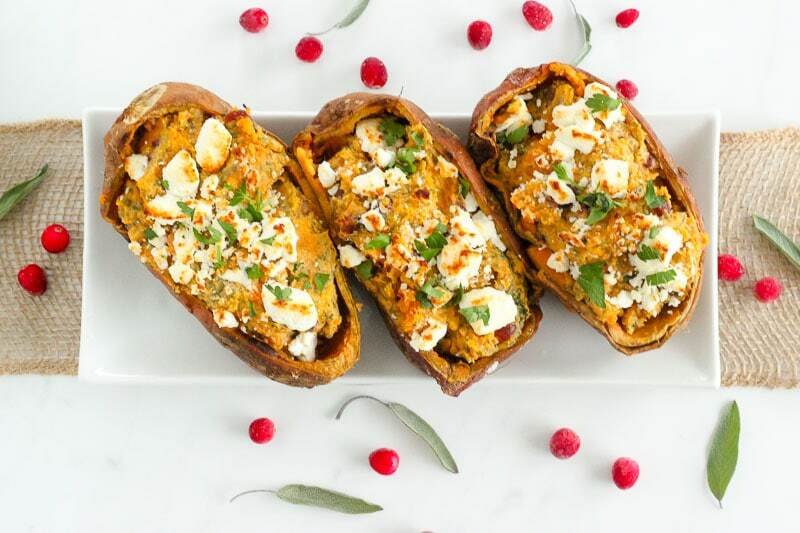 Scoop the filling back into the sweet potato skins. 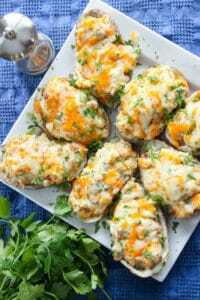 If you're baking them right away, sprinkle with crumbled goat cheese and bake in a preheated 350 degree F oven for 10-15 minutes, or until they're heated through. Broil slightly if you want the cheese to brown. Sprinkle with a little fresh parsley before serving to make them pretty! If you'd rather refrigerate them before baking you'll just need to take them out about 15 minutes before cooking and add about 15 minutes to the bake time.